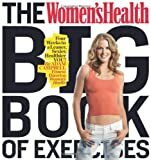 The Women’s Health Big Book of Exercises is the essential workout guide for anyone who wants a better body. As the most comprehensive collection of exercises ever created, this makeover manual is a body-shaping power tool for both beginners and longtime fitness buffs alike. From start to finish, this 480-page makeover manual bulges with hundreds of useful tips, the latest findings in exercise science, and cutting-edge workouts from the world’s top trainers. Read more about this book!